In 1970 two individuals had a vision for a school that would be uniquely different from that of the standard educational programs of the time. Their goals were clear: to build a curriculum that supported and encouraged children’s lively intellects and to create an environment that was flexible enough to respond to the individual child. In addition, both wanted to provide stimulating before/after-school care that offered opportunities for growth and learning — an unusual concept at the time. Bixby will celebrate its 50th Anniversary in 2020. Society and education have changed in many ways across that approaching 50 year spread. Global economies, social media, environmental awareness, changing employment needs and opportunities, and transition from rural to urban environments make today’s generational needs very different than those students attending Bixby in the early 1970s. Yet, Bixby remains true its founders’ core; the “why” behind their vision. I see their “why” as creating a place where the ability to “nurture every student thoughtfully” through an intentional program of academics, arts integration, and citizenship were and remain the cornerstones. That “why” is important because it guides all decisions that will impact the ability of staff to nurture every student thoughtfully. Nearly 50 years later the original “why” is still the same, but the how and what components of taking care of every student must reflect best practices, current research, and ever evolving programming that will prepare students for the world they will live, work, and play in. The research is consistent and clear that today’s educational environment must provide three elements. Schools must develop students that are literate and numerate and actively take part in problem solving where all levels of critical thinking are integral. Second, schools must balance the academic foundation with rich opportunities that allow students to imagine, create, and innovate while learning that failure is a natural and essential part of learning. In many ways, learning to fail is the bridge to learning to succeed. And, third, students are more likely to be engaged when their passions and interests are aligned with learning opportunities. So, whether its developing grit and resilience (GRIT, Angela Duckworth) or the importance of the 4 Ps: projects, peers, passion, and play (Lifelong Kindergarten, Resnick), school must reflect learning that develops people who can adapt, collaborate, create, and follow-through. Time must be allocated through intentional scheduling that allows these experiences to take place (The Genius Hour, Krebs and Zvi). Integrated within these concepts is the critical element that we are never “fixed” or stationary in our ability or our mindset. We have plasticity, and ever available growth opportunities as we choose. What type of mindset we use in teaching children is vital (Growth Mindset/ Dweck). 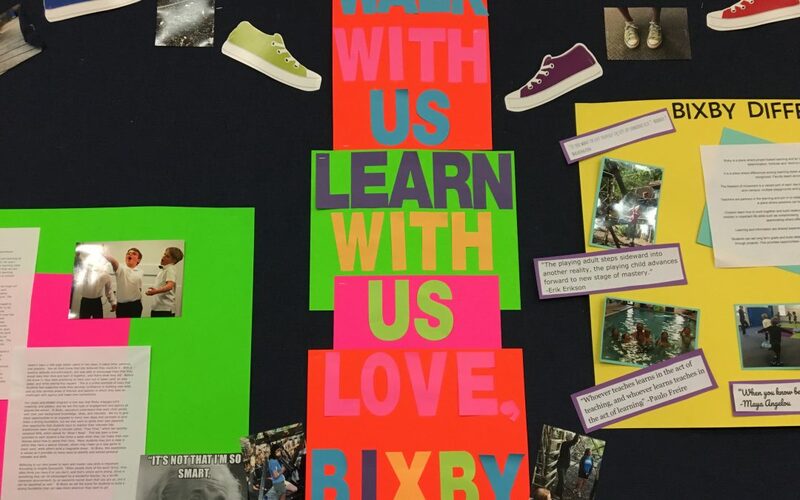 During this year and next, Bixby will both integrate and explore ways to provide intentional opportunities for students to be seen and heard in pursuit of their passions. Across multiple domains, students will experience the cycle of creating using trial and error to deepen the value that resilience plays. These lessons are life’s instructions for seeing success from different points of view across environments and relationships. And, through it all, Bixby will remain true to its “why” and support each child’s opportunities to see the possibilities. I think it is so important to explain to present parents and prospective parents that what Bixby does and has done for close to 50 years is backed by research. This little essay does some of that. I hope Lynn will do more of this as the year progresses.